Do you ever had trouble with converting thousands of existing photos, e.g. from PNG to JPEG? Can’t find a neat GUI program to actually do this job painlessly, without browsing through a slew of options? Do you actually want to waste time to make a complicated batch script just to do simple jobs to satisfy your lazy constructive brain, like the way I did? While I’m sure there are programs that does exactly that out there in the woods, this very simple procedure would also do the same job, in a small code, in so much lesser size. Assuming you didn’t accidentally stumbled on this simple, unoriginal, and messy post out of nowhere and you had genuine interests as a computer savvy, you can continue reading this post. Actually, no one can stop you anyway. Assuming that you’re also using one of the modern, very popular OS that is Linux that is Windows, it’s just a code away using Notepad. We’ll gonna make a simple batch script. Batch scripts are very notorious, aside from being a very high-level language (it’s a script interpreted by an interpreted interpreter… sort of), considerable amount of hackish code and workarounds are used just to do a freaking simple job, that a low-level language can easily do, that even Bash has native support. Basic example is the sleep command (used to pause the program for a definite amount of time), which Batch (or cmd) mysteriously doesn’t have, instead you’d rely on ping which is a network diagnostic tool. Most of this is basically a consequence of the nature of its syntax. It was like it was passed along and played by many engineers that does seem to have their own fetishes, err, version of what kind of creature it should be, like a baitch (sorry). Compared to Bash, the Unix shell equivalent, Batch is frustrating to some extent. In spite of this shortcoming, Batch is still convenient and useful as a script, when you know the way around it. Heck, you can even do a routine that do complicated task, like syncing and patching files and binaries through a server while using queue techniques, just by using batch script (Of course, in conjunction with real native programs). I know, I’ve done this. Source? Nah, you think you can get free shiny codes? Kidding. disables echoing of sound through your sound device, you will have difficult time just understanding the syntax of this code. Knowing these fundamentals will give you much more difficult time in understanding the code that I will provide here. Trust me. If you’re a batch person, you’re gonna understand this immediately like a native Latin speaker would to Latin. For an unsuspecting programmer that goes straight to writing codes and whatnots without care in the underlying OS, they can scratch their head. echo %bname% | find "480"
if %ERRORLEVEL% EQU 0 set "resolution=480"
echo %bname% | find "720"
if %ERRORLEVEL% EQU 0 set "resolution=720"
echo %bname% | find "1080"
if %ERRORLEVEL% EQU 0 set "resolution=1080"
ffmpeg -i "%%~G" -vf scale=-1:%resolution% "output\%%~nG_resized%resolution%.jpg"
ffmpeg -i "%%~G" -vf scale=-1:%resolution% "output\%%~nG_resized%resolution%.png"
Looks so simple, yet complicated enough, in a small code, isn’t it? If you immediately (or even barely) understood the procedures above, congratulations! If you didn’t, don’t fret! This is actually a very simple batch script compared to those insane ones (I made one myself, well I considered it as one…). This actually just resizes your JPEG/PNG images. We’re gonna break it down to parts so you can know what parts to edit to manipulate the program to the way you needed, but before that, did you notice the line ffmpeg in the code? We have to get and set that up before this program would even work! Head over first to https://ffmpeg.org/download.html. Now click the most obvious icon there (I trust you to have a beautiful, imaginative mind.) No, not the download button! The Windows icon! (So much for obvious!) Then click its corresponding link ‘Windows Builds’. It will take you to another page. Now, get either 32-bit or 64-bit static (if you’re in a 64-bit machine). My estimated size for FFmpeg 32-bit is around 12mb (64-bit is larger). I thought I said less size! Well, it is still lightweight for me. After you downloaded it, extract the contents and specifically isolate ffmpeg.exe. Copy it somewhere; any folder will do. Now, in a related note, you can actually use FFmpeg to convert, encode, re-encode, extract, apply filter, anything that you can do to manipulate your media, be it video, audio or images. It is a little bit manual, but it is part of its charm. You can build automated scripts and macros to precisely do specific jobs. Fine engineering, at best. Now with your FFmpeg ready, copy the code above and paste it in Notepad. After pasting it in Notepad, save it as a batch file with the extension ‘.bat’ (e.g. “imageresize.bat”), on the directory/folder where you placed ffmpeg.exe previously, and… viola! It is now operational and ready to go. Now you may have got the gist of how things work. You can also use the PATH environment variable to include the folder where ffmpeg.exe is located, or place the ffmpeg.exe directly inside your Windows’ system32 folder to give more freedom to the location of the batch file (you can separate them this way). To test if it works, from the explorer, drag the folder where the images to convert are contained, and drop it on the .bat file you just created. If successful, ffmpeg.exe will run (as evidenced in the console output), converts your images one by one until all are finished, and it will exit. You will find the output inside the \output folder in the folder of the images you just converted. If all is well, all output files will be present there. If not, well, there must be something wrong, which is beyond the topic of this post (sorry). Without worrying on what each line does exactly what, we proceed to the code breakdown. No, I haven’t forgotten this one. No, I won’t explain each command one by one as this was intended to be a short post. Look what happened! The segment above sets the initial working directory based on whether we supplied an argument to the batch script or not. 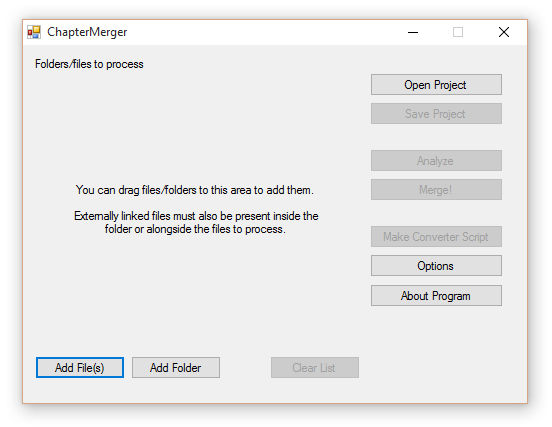 By dragging and dropping a folder to the batch file, we essentially provided the Explorer an argument to use when running the batch file. There are many ways to supply an argument to a batch script, like providing it through a shortcut, or running it through cmd.exe with an argument. When there is no argument supplied (essentially, just executing the batch file directly), the working directory defaults back to the current directory where the batch script is located. So now, there are two ways to use the batch script! By dragging and dropping the folder itself to the batch script, wherever it is located. This is the main segment that does the legwork. I could have used nested for loops and use a variable that containes file extension names to recursively loop through the data, but I figured that it is a bit overkill for our simple, mundane task. Though it could have been extensible and would work brilliantly. That’s it! We need to wrap up this abomination of a post now, quick. There are so many possibilities with FFmpeg alone. Now you got it, your ultimate image converter/resizer using FFmpeg! In also a related note, assuming that you are a computer wizard/hobbyist/elite/shut-in, you can also build a custom FFmpeg with custom encoders from scratch using Cygwin, a convenient linux shell for Windows. Your ‘nix geekness will really shine there. Hope this long post helps! After many days and nights – I have been through many battles. One battle involved my scratching of my head many times. This battle is me trying to build FFmpeg with Cygwin. A new post and about computer stuff? Yay! If you just happen to stumble upon this mostly irrelevant post to the world, and you know absolutely nothing about programs and have no interest on these kind of things, you can opt out and stop reading right now, or better yet read some of my other post, as if there’s many worthwhile one, or just go outside and do some “real world” stuff instead of being in front of your computer lazily glazing your eyes with artificial radiation. What the feck is an artificial radiation anyway. If someone referred you to this page, like a search engine, then I’m fluttered. Continuing with the topic. This is about making the latest source snapshot at least compile within Cygwin under Windows. If you didn’t know about Cygwin, it’s an excellent (at least for me) unix shell layer for Windows. This can entice you if you miss bashing (sorry) and you want to experience it under Windows or if you want to use practical UNIX tools under Windows. The problem with Cygwin (a system always have a problem; it’s the charm of engineering) is because it’s practically an emulation of the Unix shell (even though technically it’s not an emulation; it’s more of an application layer, like Wine on Linux), and you are guaranteed to encounter a slew of problems here and there, especially if it pertains to libraries and dependencies. You can think you can get away with the base installation of Cygwin and just compile those dependencies yourself, but you’ll just waste your time. Because of the low-levelness of these things, they are specially pre-built by the Cygwin team and are available over the repositories, and can be fetch by the setup program. So we will use the pre-built version of these little ones. However, some are missing on the repositories; most likely due to licensing issues. So to get around this, we can try to build it ourselves and cross your finger, or find a third-party repository. We will go on the harder route, and we’ll build them ourselves coz we’re masochists Fortunately, there’s one available. We will come to that later. And you might have thought, what the ♥♥♥♥ is FFmpeg? FFmpeg is the most powerful, open-source command-line media factory for all your media handling needs. Hands down. You can use it to efficiently convert, repack, encode, re-encode, etc. almost all various image, video, and audio formats. It is the back-end that powers most powerful, often free, encoders, decoders, and players out in the wild, like MPlayer. Later versions also includes a player and a server, ffplayer and ffserver, respectively, but mainly it is used for repackaging and encoding purposes. We will only focus on the ffmpeg binary on this page. Install them through the Cygwin setup, together with the entire “Base” packages. gcc4-core is gcc-core. git will not be used but install it anyway (for the future). bc and diffutils are still important even if you don’t do FATE so get them anyway. mingw-runtime is required even though we will not use Mingw32 for building. The 4th row is the most important, but all of these are not available in the official repos (you know the reason). In order to get them, follow the guide there and use Cygport repositories. Make sure you get yasm and libtheora, as those others provides the codecs, albeit popular codecs, so you might get them as well. Since we will build libfdk_aac and libx264 ourselves, we can ignore libfaac, libaacplus, and libvorbis (they’re missing in the repositories anyway). You can also ignore libschroedinger, since we will ideally use x264 for h.264 codec. dos2unix is required for conversions of formatting characters (e.g. newline character) from dos unto Unix format. Make sure you get cygport, it provides the proper lib-utils to build under windows. Without it, all of your attempts to build will throw you an error. autotools is required for one particular build process. pthread is required to build ffmpeg with pthreads, as it’s supposed to provide multithreading support. You can build without one; in fact, it’s not required if you’ll only use x264 codings, as libx264 provides this functionality for itself. Make sure to press enter on the last command. This will build libx264 for us. If all required packages were installed, the build process will be successful. You can find libx264.exe inside ~bin on your cygwin home folder. If you’ve come across --enable-win32thread, you’ll know the name is sweet but don’t ever use it!! (Not that you care.) You’ll lose multi-threading capability since we are not cross-compiling for windows; we are compiling for Cygwin. This will build libfdk_aac. The “F” stands for Fraugher, something like that (it was German, ha ha). Again, if all packages mentioned in this post were installed, this will build successfully. It doesn’t come with an executable binary so it doesn’t produce an output inside ~bin. Now, we will have a library that will enable us to encode High Efficiency Advanced Audio Codec (HE-AAC). Quality audio for lower bitrates. That’s German engineering for you. Yay! This is my configuration. Be ready for a loooong time of compilation. If you didn’t install libvorbis, you can remove its line. The same with other codecs that you didn’t install. We disabled ffplay, ffprobe and ffserver for this setup since we didn’t install some of their dependencies. If you want them, you can always head to the official FFmpeg documentations and wiki for more information on them and their dependencies. Now, unless you find watching progress and numbers appearing entertaining (like me), that’s a boring compilation! You will find ffmpeg.exe inside ~bin. If you care about bits, we used x86 toolchains, so the binary is 32-bit. You’ll notice that it’s pretty big compared to other ffmpeg builds out there in the jungle, but don’t fret. It was built statically which means that included libraries are all packed in that one binary, and under Cygwin. It would be different if you built it using mingw32. But if you wanted to cross-compile it, you could have better compiled it under other sane platforms (like Linux), or better, under Windows (if you know to setup Visual Studios or Mingw32 for ffmpeg, that is). But why Cygwin? Because sometimes these kinds of work and process are easier here, evident by this one post alone. If you don’t want these extra dll’s lying around, you can always cross-compile it or natively compile it in Windows. That will be another story. To know the command parameters, run ffmpeg -h.
ffmpeg -i "!filepath!" -c:v libx264 -preset:v veryslow -crf 27 -c:a libfdk_aac -profile:a aac_he_v2 -strict experimental -b:a 32k -movflags +faststart -vf "scale=-2:480" -r 24 "!outfile!" “!filepath!” is your input file, while “!outfile!” would be your output file. For more information how to use ffmpeg, FFmpeg has an excellent documentation for all its flexibility and possible use.